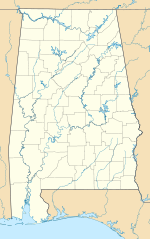 Auburn University Regional Airport with the Robert G. Pitts Field (IATA: AUO, ICAO: KAUO, FAA LID: AUO) is a public use airport located two nautical miles (4 km) east of the central business district of Auburn, a city in Lee County, Alabama, United States. The airport is owned by Auburn University and was formerly known as Auburn–Opelika Robert G. Pitts Airport. It is included in the National Plan of Integrated Airport Systems for 2011–2015, which categorized it as a general aviation facility. The airport offers no commercial service in or out of Auburn. The closest airport of significance outside Auburn is the Columbus Airport (40 miles via US-280) in Columbus, Georgia which is roughly a one-hour drive to and from Auburn. The closest commercial airports are the Montgomery Regional Airport (60 miles via I-85) in Montgomery, Alabama, the Birmingham–Shuttlesworth International Airport (115 miles via US-280) in Birmingham, Alabama, and the Hartsfield–Jackson Atlanta International Airport (100 miles via I-85) in Atlanta, Georgia. These airports are within a two-hour driving distance to/from Auburn and offer air service to most of the world's major airports. Daily bus/van shuttle service is available from the Auburn area to the Atlanta airport. In its earliest days, the airport was nothing more than a grass field. The home to one airplane, the airport was very different from its current status. Today, the airport is home to some 55 aircraft and Auburn University's Department of Aviation and Supply Chain Management. When first constructed in 1930, the Auburn–Opelika Airport was a private airfield built to serve the sister cities of Auburn and Opelika located in Lee County, Alabama. It was also intended to serve the Alabama Polytechnic Institute (API), later renamed Auburn University. Over the next decade, the airport would go from a private airfield, to a stop along the mail route for the Civil Aeronautics Administration, and eventually become a training ground for the U.S. Military. It was during its time as a Navy/CAA War Training School that the Auburn School of Aviation would be developed. Over the next several decades, many improvements would be made to the airport, making it a standard of excellence in the general aviation field. A new terminal and administration building was constructed in 1950 consisting of both enclosed and open flight decks, a restaurant, flight ready rooms, classrooms, and operations offices with local, state, and federal funds. Also in the 1950s, Medium Intensity Runway Lights were installed, runways were resealed, and an access road to Glenn Avenue was constructed. The 1960s continued to see major improvements to the airport; pavement for aircraft parking was completed along with the reconstruction of the 18/36 and 11/29 runways and taxiways. During the 1970s, 1980s and 1990s a concentrated effort was made to acquire the land and funding for the 18/36 runway extension. In addition, renovations and several improvements were made to the airport facilities, updating them to modern standards. In January 2002, the ribbon cutting ceremony was held to open the 1,332-foot (406 m) runway extension. The runway was extended from 3,933 feet (1,199 m) to 5,265 feet (1,605 m) and was widened from 75 feet (23 m) to 100 feet (30 m). As of August 2006, the Federal Aviation Administration gave clearance for the installation of a glideslope antenna and approach lighting system (MALSF) for runway 36. These improvements were completed in late 2007. Plans are being made for extensive crack repair, pavement rehab, and painting of runway 11/29, along with minor crack repair and repainting of runway 18/36. Site prep work for four hangars, a new ramp area, and a new terminal was started in January 2008. These improvements will help the airport provide better service for the large crowds of people who fly in to attend college football games at Auburn University. In November 2009, the Auburn University Board of Trustees voted to rename the Auburn-Opelika Robert G. Pitts Airport as the Auburn University Regional Airport with the Robert G. Pitts Field. A new terminal was dedicated in September, 2010. Auburn University Regional Airport covers an area of 423 acres (171 ha) at an elevation of 777 feet (237 m) above mean sea level. It has two runways with asphalt surfaces: 18/36 is 5,264 by 100 feet (1,604 x 30 m) and 11/29 is 4,000 by 75 feet (1,219 x 23 m). For the 12-month period ending July 23, 2010, the airport had 65,445 aircraft operations, an average of 179 per day: 97% general aviation, 2% air taxi, and 1% military. At that time there were 53 aircraft based at this airport: 77% single-engine, 13% multi-engine, 8% jet, and 2% helicopter. The FBO at the Auburn University Regional Airport is staffed from 7:00 AM to 7:00 PM Central Time (-5, -6z) weekdays, 8:00 AM to 5:00 PM weekends. Fuel services are available during this time, as are use of the FBO and airport facilities. Terminal Procedures, IFR Charts, Log Books, and similar pilot supplies can all be purchased inside the terminal building. There are additional charges or "call fees" for after hours assistance for fuel or supplies. Services include WSI weather, courtesy cars, aircraft maintenance, oxygen, nitrogen, GPU availability, vending, cable TV, computer workstations, wired and wireless Internet, and LAV service. Maintenance is available during normal working hours, from 7 AM to 4 PM local time. AUO's four mechanics, three of whom have their Inspection Authorization License (IA), can service most all single engine, twin engine, and turbo-prop aircraft, but provide only minor powerplant and airframe service. After hours and weekend service is available on demand at a rate of time and a half. ^ a b c d e FAA Airport Master Record for AUO (Form 5010 PDF). Federal Aviation Administration. Effective January 5, 2017. ^ Auburn University Regional Airport transportation statistics. US Bureau of Transportation Statistics. Retrieved January 19, 2017. ^ "IATA Airport Code Search (AUO: Auburn-Opelika)". International Air Transport Association. Retrieved July 20, 2013. ^ Stallcup, Katie. Airport Director: Plans progressing. Opelika-Auburn News. February 20, 2008. Accessed March 2, 2008. ^ Trustees OK dual degree program. Opelika-Auburn News. This page was last edited on 11 April 2018, at 21:10 (UTC).